Water wars caused by climate change aren’t something we need to worry about. Climate change may threaten security, but countries won’t be going to war over water any time soon. 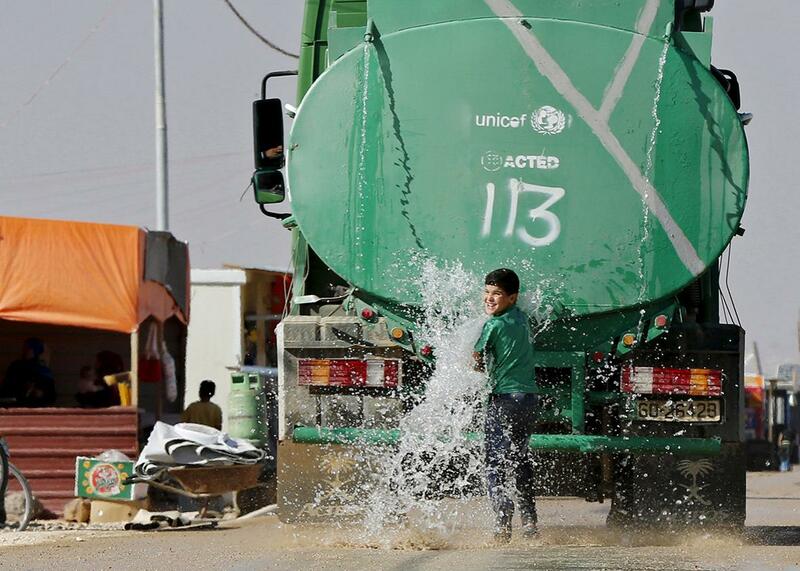 A Syrian refugee child plays in the water from the back of a water tanker at a refugee camp, in Mafraq, Jordan, near the border with Syria, on Nov. 29, 2015. As negotiations at the Paris climate conference head into the final, critical stage, a piece of pop wisdom is coming to a boil: “They say the next wars will be fought over water.” Some politicians, academics, and laypersons angling for progress on climate change have picked up the frenzied refrain. In the process, they are dragging us all into a “water wars” trap—and compromising real progress toward sustainable solutions. Water is the principal medium through which climate change expresses itself, particularly through intensified floods and droughts. But despite melting glaciers, increasing water scarcity, and a run on resources, there is not a single ongoing “water war” being fought on the planet—nor has there been one in 4,500 years. Yet some media outlets are calling what’s happening in Syria and Iraq a water war and warning about potential future conflicts in Nebraska, India, China, and Turkmenistan. So how is it possible such an idea so thoroughly permeated public opinion when the evidence suggests otherwise? Drama sells. From Dune to Waterworld to Mad Max: Fury Road, the public has been intoxicated by fantastical struggles over water. Media outlets have picked up on these sociological cues and are increasingly including “water wars” in the already terrifying list of adverse impacts we can expect from climate change. The result of this sensationalized perspective on water scarcity is that it diverts focus away from the real issue of poor management and governance of water resources. The attention, however, is counterproductive. Strategically, water is a poor choice of resource to fight over. First, an upstream country would not attack a downstream country over water, as it controls the flow from the territory it already occupies. In the case of a downstream country attacking an upstream country, the country downstream would have to be more powerful. There are very few examples of this, but one comes to mind and is instructive to inform the thinking on the likelihood of “water wars.” Consider the example of the Nile River in East Africa: Ethiopia is currently building the much-publicized Renaissance Dam upstream from Egypt and Sudan, a concern for the downstream countries because of the potential to capture or divert water. Yet even in one of the drier parts of the planet, there have been continuous diplomatic discussions, now in their 10th round, not war, over finding solutions to the Renaissance Dam issue. Additionally, war is expensive. To control water, you must control territory, and then you must move the water to your own territory. There are simply cheaper solutions than waging a war. There are many examples of how, even in times of acute armed conflict, countries cooperated over their shared water. Israel and Palestine consistently cooperate over water issues much more than they would lead anyone to believe. The Sri Lankan government and the Tamil Tigers cooperated over water before the war ended. Pakistan and India signed the Indus Waters Treaty amid tensions in 1960. Cooperation has been the norm, not the exception. The reality is that a “water war,” an armed conflict between two nations over water resources, has not been fought since 2500 B.C. between the city-states of Umma and Lagash in the basin of the Tigris-Euphrates river system. According to research conducted by professor Aaron Wolf at Oregon State University, the historical record consistently demonstrates that water is a greater catalyst for cooperation than conflict, and there is reason to believe that this trend will continue despite continuing global challenges of water scarcity. Ultimately, there is more to gain via collaboration than war over shared waters. Beyond the water itself, there are benefits to be derived from a basin as a whole, through cooperation, which include hydropower, agricultural production, improved water quality, and disaster risk reduction through upstream storage in case of drought and flood mitigation. This does not even include potential spillover effects from cooperation like trade and regional integration. This does not negate the importance of water as a security issue. While there haven’t been wars between nations over water, subnational violent conflict over water happens frequently, from two farmers arguing over water rights in Mexico who killed each other in an old-style pistol duel to ISIS seizing control of the Fallujah Dam, as is outlined in the Pacific Institute’s Water Conflict Chronology. These are mostly stand-alone events, but sometimes they are a factor, though one of many, in contributing to regional or national instability. This is one reason why governments support and fund water and sanitation projects, especially in post-conflict areas. Safe access to drinking water and sanitation leads to dignity, health, the pursuit of a livelihood and education, and healthy watersheds contribute to healthier communities and economies. But to focus all attention on water as a motivation for war is to miss the multifaceted nature of war, which impairs finding solutions to both conflicts and the water problems. For example, Stratfor Global Intelligence published an article recently stating that the Islamic State was waging “water wars.” The article describes ISIS as using water as a weapon, but this is not the same as a “water war.” If the solution to ISIS were better water resources management, planeloads of hydrologists and engineers would be on their way to the Middle East. Using “water war” to frame the ISIS issue is a red herring that detracts from the true nature of the problem. A “water war” is an irresponsible oversimplification of dilemmas that are nuanced, complex, and multifaceted, which include issues of economics, law, politics, culture, diplomacy, and even basic concepts of water management. Advancing the idea of “water wars” does not address the underlying reasons why a dispute, or poor water governance, exists in the first place. The rhetoric and narrative that are propagated by “water wars” scenarios through the climate change dialogue is one that is counterproductive to finding real solutions to the water problems of the world. Let us reframe the discussion and focus on how we can meet people’s water needs, to promote peace and cooperation, rather than sensationalizing a scenario that is unfounded and dangerous. Our world leaders in Paris do not need attention drawn from the task at hand by talk of “water wars”—they need all the help they can get.